Currently in the twilight of an almost-successful Kickstarter campaign, Tangiers looks set to offer one of the darkest, most disturbing and grotesque takes on stealth gameplay we’ve ever seen. 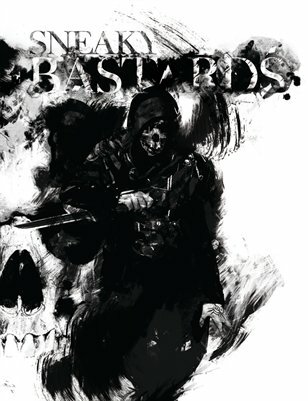 With strong, unique literary and artistic inspirations cloaking a mechanical foundation reminiscent of Thief’s systemic sandboxes, it is a game that Sneaky Bastards unashamedly wishes to champion. Full disclosure: we have backed Tangiers’ Kickstarter campaign. We think you should too. Andalusian has dived into extensive detail about Tangiers’ avant-garde inspiration on the campaign page itself, but for further insight we turned to developer Alex Harvey. Sneaky Bastards: What kind of reality is the abstract world grounded in? What relations to time period, geographic location and societal structure can we expect to encounter? Harvey: The game’s reality within the urban areas is a fairly anachronistic faire, a timeless, rigid entity of control built out of bricks, concrete and asphalt. There’s a lot of different directions within it, but it’s based on exaggerated, concentrated British inner city characteristics. Lots of brutalist architecture, lot’s of… patchwork development, aged streets surrounded by newer builds. We’re mindful of the… arrogance of a lot of Architectural theory and practice, the approach within that of enacting and dictating social change. Stretching that into architecture as a form of mass control. An agent of control, an antagonist in itself. Despite the abstraction and the anachronistic setting we’re contradicting ourselves slightly by being mindful of history. Not on a macro level but looking into the micro, the development of individual streets. What they used to be, what’s been built up on top of the original architecture, the disruption and social change. No true exposition of this, but a grounding, a suggestion of history. What kind of abilities are available to the player character outside of the normal stealth toolset of hiding in shadows? For example, how do they remove a threat? Well, there’s our use of language in the game – any spoken language materialises into existence, can be collected and then reused to mislead, lure and redirect foes. More specific words can also be used to alter reality – for example, the word “smoke” as part of a sentence can be turned into a smoke screen. The cliché “Guess it’s just rats” can become a Dishonored style swarm of rats. These are often one off and quite unpredictable, so you need to rely on the rest of your abilities. Our other equipment mainly revolves around indirect removal – often in the form of setting traps, laying tripwires… a disconnected disposal. There’s a focus, a balance within these. Take for example, one trap that springs the target into a noose. Completely silent, but it leaves a visible, hanging body that you’re unable to hide. It’s not going to be a massive tool-kit available to you, it’s a tight, well-defined collection of strengths and weaknesses. Tell us about the ‘eye’ visibility indicator. How is that communicating threshold states of visible / not visible? How analogue are those states themselves? Under the hood, the player’s visibility is measured as a percentage value. Broadly speaking, the lower quarter has you almost certainly unseen, while the upper is the opposite. The extremities are pretty much yes/no states, but between (and overlapping) those thresholds is a more situational middle ground. The percentage is fed to any relevant AI characters who in turn apply that to their own perspective. Distance, current/past alert states, direct/peripheral line of site and audio all act as the situational modifiers to the enemies’ interpretations of your visibility. The actual eye visualisation isn’t a linear representation of the percentage. We apply a curve to it to make it more intuitive; If the eye is almost shut then as long as you’re sensible and don’t stand right in front of anyone, you’ll go unseen. The intuition carries over into the different shades of “half-closed”; part of the learning curve is becoming more attuned to this, to the mid-ground, and to being able to better weigh the risk of chancing it outside of pure shadow. What options are open to the player upon being discovered? One thing we’re not opening up to the player is pitched combat when discovered. Sure, you can take out enemies if you get the element of surprise, and there’s that split second “jump” moment with the guards where you can take them down, but no one on one combat. Instead of that direct combat, there’s the rougher, clumsier tackling, pushing people out of the way, knocking them back to give you a split head start when you flee and regroup. There’s degrees of option in this; using the extra time, your knowledge of the environment and quick thinking to bring them into a lethal trap, or to simply escape. It’s very much taken from how I’ve always approached discovery in Thief; although the game is sandbox it’s still a very… personal direction. How do you communicate the reactions of more abstract enemies? Do they exhibit patterns or behaviours that can clue players into their current state of alertness? Behaviour, animation and audio. There’s plenty of identifiable behavioural patterns that we can adopt, plenty of familiar movements. Even if it’s a completely abstracted being, it’s important to ground them in reality to a certain degree… for example, incorporating animation based upon wounded or cornered animals. Tangiers is a very tactile, very sensory game – even if something in the world is far removed from our own reality, it needs to create that direct, immediate reaction and instinctive understanding in the player. That said, we need to ease things in for the player… with the off-kilter inhabitants, we are putting a specific focus upon how we first introduce them. With the vulnerability of Tangiers, if we always leave it to the player to learn how a creature behaves, what it’s traits and states look and sound like, then that’s only going to end up bad. Trial and error, reloading, the player making mistakes that they aren’t inherently responsible for. Sure, there’s times that we can subvert that, but as a general rule we need to put a good deal of energy into deploying new parts of the game. We know the missions themselves will be open sandboxes, but what kind of structure links them together? Is there a linear progression between each? Our open landscapes lie between each urban area. Navigating those is a significant part of the game, a sort of Shadow of the Colossus type flow. Using that as a hub of sorts (though with a far more active role in the overall narrative, progression and pace), you can come across the missions in any order, as well as a number of side narratives and curiosities. There’s a sort of road trip vibe in this; everything’s spread about to become part of your journey rather than completionist “find them all” discoveries. At the start we drop you in a fairly empty, sparse open plain. With that initial moment, we’re going for recalling… games such as Arena, where initially you’re left with little direction at all. Not something we strictly hold onto for long in the game, but it’s a good initial declaration of the game’s freedom.